The holidays are the perfect time to share family stories and rituals, according to Robyn Fivush, a psychology researcher at Emory University who specializes in children and memories. Fivush’s research shows that family storytelling is very beneficial to child happiness and development. "Children really respond to routines and rituals. The holidays provide both. They are routine in that they are repeated annually, but they're also special. The planning and anticipation created by the holidays foster predictability and stability," says Fivush. 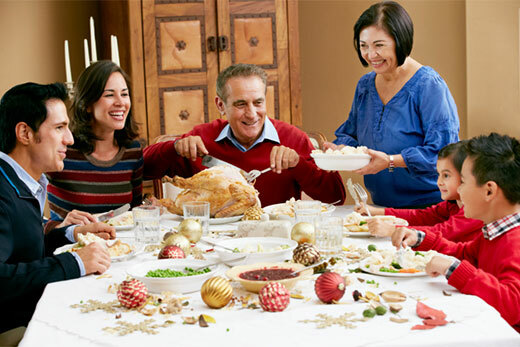 The holidays also provide a time for families, including extended family members who increasingly live in other states or countries, to gather. Relationships with extended family members, especially those who are older, are vital and an important part of a family’s narrative, Fivush says. Fivush partnered with Emory psychology professor Marshall Duke to create some advice for parents on making the holidays memorable and special for their children with the help of storytelling and family rituals. Times that families gather, especially around food, are times to tell stories about the history of the family. Kids need to hear about the adventures of their parents, grandparents and other relatives, says Duke. Family rituals are very important, even silly ones. The longer they’ve been part of the holidays, the better, but feel free to invent new ones, says Duke. Family stories should include bad things that happened, as well as good things. Especially important for children’s resilience are stories about bad times that were overcome and actually strengthened the family. "Bad things happen to everyone. American myth-type stories are beneficial, stories about how a family member overcame adversity and came out the other end stronger and wiser. Those stories teach children that bad things happen, but with the help of your family you'll learn and emerge stronger and move on," Fivush says. "Funny and happy stories are important too. Laughing together makes families feel closer. Everyone knowing how the story ends or knowing the punchline creates an emotional bond," she adds. Drive around and look at Christmas and other holiday decorations in neighborhoods all around your town. Many religious institutions, hospitals, office buildings/parks and other places with holiday spirit often mount spectacular displays. All of these make memories for kids and families, especially if they become ritualized year to year, Duke says. "Especially for children, they want to hear the story over and over. Then they might start participating in the telling of the story. It helps them feel like part of the group," Fivush says. Look at family photo albums together. First, create permanent albums from easily-deleted photos stored in cyber-space, says Duke. Don’t mess with the holiday menu! You might add something new, but don’t take away anything, even if it’s not on the “healthy” list, says Duke. Don’t seek perfection. It’s not attainable and can be stressful. Shoot for a “good enough” gathering; which is often the best, says Duke.